A few months ago I created this mantra for myself. 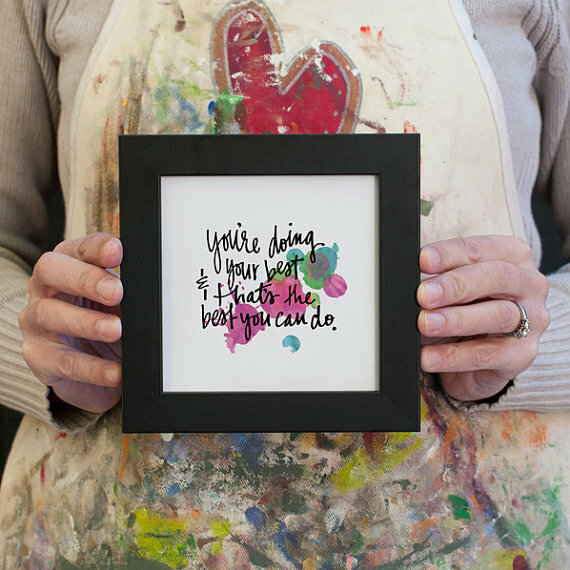 Today we're adding it to the shop because I'm pretty sure we all need to be reminded of this at one time or another! And, here's the cool part, place an order of $20 or more in our shop in January and we'll include one of these mini prints (they are tiny!--just 5"x5") for FREE! Want to purchase the print by itself? See the listing here. FYI: This may be my first 'professional' collaboration with Miles, whose preschool artwork provides the backdrop for my hand-typography. Vraiment adorable et stimulant ! I like it. That's a message I could use!